The first Poster Monday comes from Canada. It’s entitled “Domestic Violence” and it was designed by Andrew Mayberry. Andrew is an artist from British Columbia, currently based in Toronto. His traditional work combines variations of textures and mixed media techniques on canvas. His graphic design and motion graphics work explore typography and design for web, print, and video. A graduate of the Bachelor of Applied Arts Illustration program at Sheridan College, Andrew seeks to inform and engage his viewers. 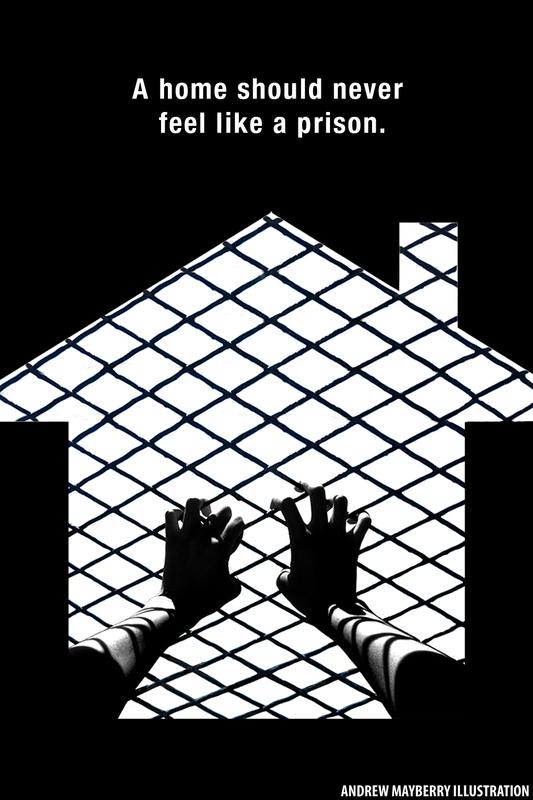 The poster was created to raise awareness about domestic violence, and show how someone suffering from abuse can feel imprisoned within their own homes. “I wanted the viewer to get a sense that they were trapped within one of these homes, looking outside from within their dark confinement” says Andrew. The poster allows people to interpret domestic violence in a unique way. The imagery is intended to create emotion about it and help people consider the harsh realities that some families face. If you would like to see more work from Andrew Mayberry visit his web page.